A two decade milestone has arrived as Klock Werks celebrates 20 years of business! that have afforded this company 20 years of survival in an ever-changing, fast-paced world. If you missed the chance to get a calendar, be sure to watch the website as a history vehicle will be featured, and the story told, each month throughout 2017. “We are honored to pay tribute to those who have gone before us and those who have helped us get where we are today. 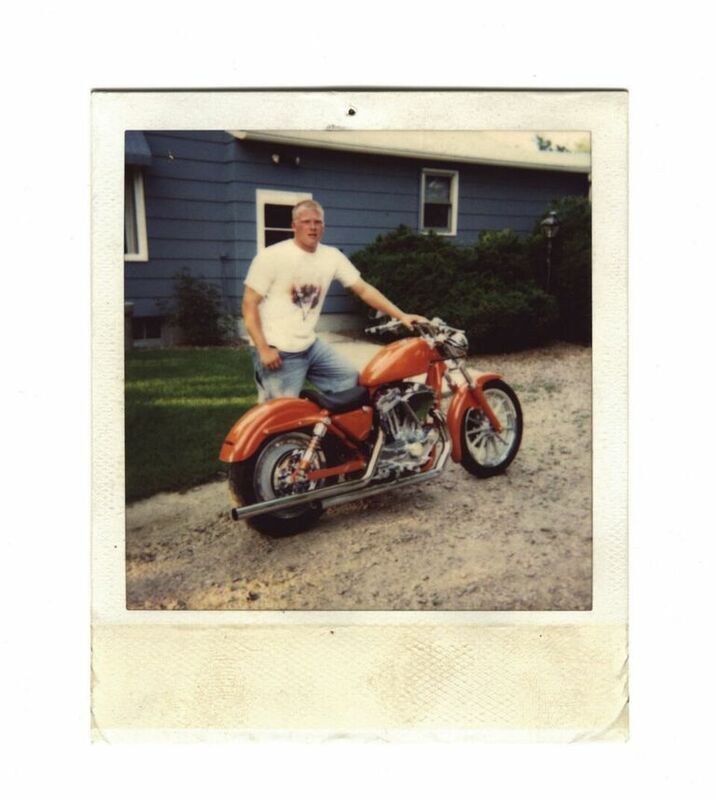 This past 20 years have been a journey — with thousands of miles driven, hundreds of bikes built, millions of smiles, and motorcycle camaraderie that has forever changed and enhanced our lives,” Dan Cheeseman, COO, said. It all began in a rural, South Dakota town where Brian Klock’s parents owned a gas station. His love of all things motorized started early! Before spray painting cars with his brothers at home, he used to charge neighborhood kids cash to ride his Honda 50. His entrepreneurial spirit and passion for a kustom touch led to an FXR project in 1988 and his first award-wi nning kustom in 1990. John “Quigley” Patton helped Brian start Klock Werks in Patton’s garage where they finished a turbo-charged bagger for Roger Klock, Brian’s dad. 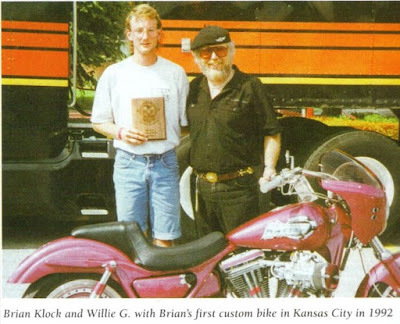 In 1997, Brian got his first magazine spread, and Klock Werks was moved into a single-car garage with no sign in Mitchell, SD. Dan Cheeseman was hired, and together, they worked on whatever came through the door. larger building afforded space for new software, more space for R&D and kustoms, and a dyno Quigley always wanted. The inception of the product line started with fenders. Brian and Dan were severely disenchanted with the quality of available after-market fenders, and after hours of prepping them, many took a one-way flight across the shop. With focus provided by Laura, who joined the team in 2005, the guys shifted from kustom bikes to a high-quality product line with ensured accurate fitment. In 2006, the growing Klock Krew accepted a call to participate in the Discovery Channel Biker Build Off. This was their chance to debut their first products and parts. The bike was a kustom bagger, the first-ever for the build off, and it won! Reporting a lift from the front end as she increased speed, the team set out to create a product that would make the bike safer for Laura to race. The patented Flare™ Windshield was born, and the company grew exponentially! The added downforce, air management, and sheer style of the part has afforded the Flare™ the title of Product of the Year, twice. Developing a parts line, there were several factors that Klock Werks would not compromise on. Top of the line manufacturing processes and materials were a must, and the company’s hard-earned dollars would stay in the USA. It all started with kustom builders, and the mission was to create accurate fitment and easy installation so anyone could kustomize their own ride. The company has stayed commited to their intentions, and vowed to always provide the absolute best customer service. Drag Specialties also accepted the product line in 2006. Laura and her daughters, Erika and Karlee, became the first mother-daughter-daughter racing team to hold land-speed records at the same time by 2008, and Klock Werks’ kustom motorcycles continued to be featured in magazines and videos all over the world. In 2012, Laura and Brian were inducted into the Sturgis Motorcycle Museium and Hall of Fame. In 2014, Klock Werks entered the Honda, Yamaha, Kawasaki, and Indian markets. Today, the company has 16 full-time employees and sells parts all around the globe. The Flare™ Windshield continues to lead as the number one selling part, but custom bike shops and garage builders utilize other high quality, high functioning parts, like the adjustable KlipHanger Handlebars, e-coated stamped steel fenders, and most recently, Klock Werks Device Mounts, powered by the iOmounts system. Klock Werks new website, getklocked.com, will follow the NEW, limited-edition 16-month calendar through 2017 with special blog posts, videos, and galleries about the tribute bikes. 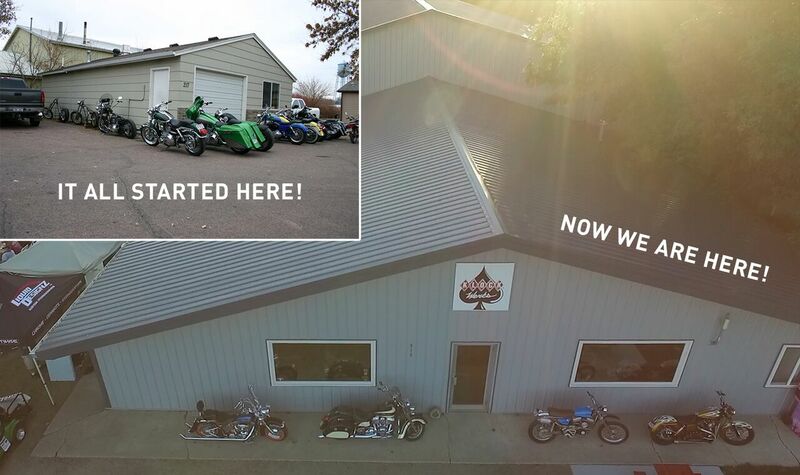 Each month, a new vehicle will be in the spotlight as we reminisce and look back, fondly, at 20 years of life, 20 years of friendship, 20 years of building rad machines, and 20 years of business in Mitchell, SD. Established in 1997 and located in Mitchell, South Dakota, Klock Werks has grown from humble beginnings to a globally recognized Brand over the last 20 years. Achieving status as “Air Management Experts”, Klock Werks credits this to the success of the original, patented, Flare™ Windshield. 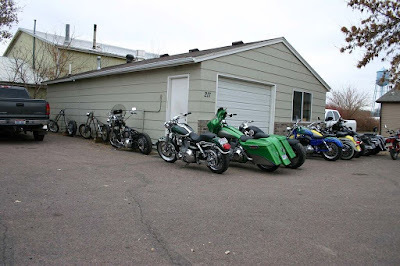 Also supplying fenders, handlebars, and other powersports parts, Klock Werks proudly leads the industry through innovation in design and quality of materials and fitment. 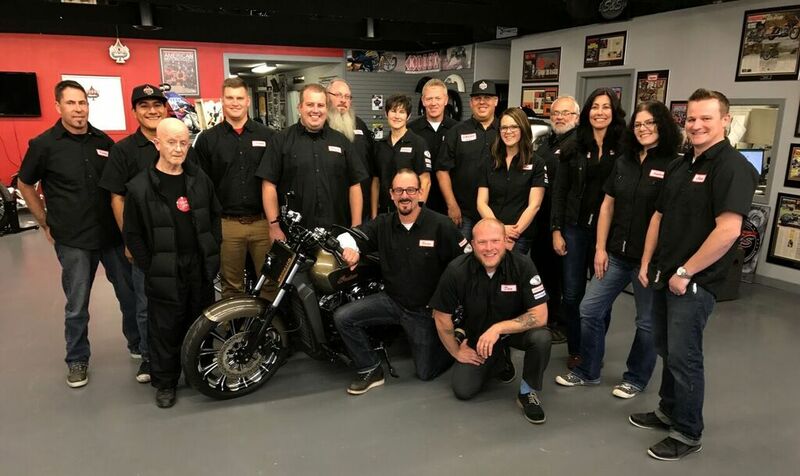 Team Klock Werks has been successful for years designing parts, creating custom motorcycles, and setting records on the Bonneville Salt Flats. You will find motorcycles, family, and faith at the core of Klock Werks, along with a commitment to caring for the needs of enthusiasts around the world who enjoy their products.